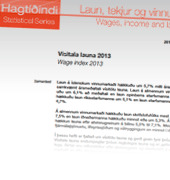 According to the wage index, wages in the private sector increased by 5.7% on average between the years 2012 and 2013. During the same period, wages in the private sector increased by 6.1% and wages in the public sector by 4.9%. The wage increase was 5.1% the central government employees and 4.7% for the local government employees. In the private sector wage changes ranged from 5.3% for Craft workers to 7.5% for Clerks.